When somebody around me mentions Peruvian food, there are a lot of wonderful things that should pop into my mind. I could, for instance, think back to my first taste of tiradito, a refined take on ceviche that features nearly transparent slices of milky-white fish in an addictive chile-laced marinade. I could also remember Peruvian potatoes and their spectrum of shapes, sizes and colors, or the hot ears of corn with kernels the size of walnuts I would buy from the women who boarded trains in small villages, selling all manner of homemade snacks from large baskets. I could think about anticuchos, I suppose, the famous beef-heart kebabs I was too chicken to try, or the enormous Peruvian tamales stuffed with chicken, olives, raisins and hardboiled eggs. I could even think of sushi, considering I had some of the best of my life in Lima. But I don’t. Embarrassing as it is to admit, my memories of Peruvian food are almost completely dominated by longings for the best granola I ever had. I’ll tell you the story. Seven years ago I went to Peru to conduct research for my Thomas J. Watson Fellowship. Although my main base was in the Andes (I was ostensibly researching Quechua language survival), I also did some traveling with an old friend whose visit to Peru happened to coincide with mine. As she had a particular interest in ruins, I agreed to accompany her on a long bus ride north to visit Chan Chan, the ancient mud city of the pre-Incan Chimu Empire. According to our guidebook, the best base for visiting the ruins was a sleepy little beach town a few miles away called Huanchaco. Huanchaco was a nice enough place, quiet and easygoing by Peruvian standards, though it had gloomy overcast skies and the kind of lonely vibe of a beach resort off-season (it was the start of winter in the southern hemisphere). The guest house we chose, like the town itself, was also pretty dead; apart from us there was only a solitary Dutch backpacker and the owners, a local man, his petite French wife, and their toddler son who ran around waking everyone up with his screams at six o’clock each morning. The husband seemed perfectly nice on the one and only occasion we saw him; his wife, on the other hand, couldn’t have been more unwelcoming if she tried. Not only did she watch our every move like a hawk, she complained about everything we did, from talking too loudly in the courtyard at night to not hanging our wet towels properly in our room. When she had nothing to complain about, she just glowered. And then there were her lips. I don’t know if they had anything to do with her foul temperament, but they were at least three sizes too big; our speculations ranged from birth defect to Botox treatment gone wrong. In any case, though I’m fully understanding of the fact that hospitality is a tough business, that seeing different faces parade in and out every day can be exhausting and that any number of personal tragedies may have befallen her shortly before our arrival, this woman really should not have been let loose near paying customers. To us, at any rate, she was just plain hostile, and to exact our revenge (and, well, because she never told us her name) we started calling her the Lip Lady. As much as we disliked her, though, I probably would have forgotten about the Lip Lady entirely in the intervening years—I mean, she wasn’t that memorable—if it weren’t for her granola. You see, apart from rooms, the guest house ran a casual café on its terrace, and along with the usual backpacker pizzas and omelettes they served the world’s most delicious homemade granola. “What’s in this granola?” I remember asking the young girl who waited the cafe’s tables, but she had no idea. I could make out sliced almonds—or so I thought—bound together into light, crisp clusters with some sort of grain, but the rest was a mystery. I scrutinized it for days, trying to read its crumbly topography for clues, but in the end I realized there was only one way I was going to be able to reproduce this remarkable cereal at home. On the day of our departure, as I settled our bill, I took a deep breath, put on my brightest smile and asked the Lip Lady for the recipe. I was sorely tempted to grab her by her overgrown lips and shake the recipe out of her, but instead I paid my bill, cursing under my breath, and made a mental note of everything she had said. Surely if I looked long and hard enough I would eventually come across a recipe that yielded similar results… wouldn’t I? I didn’t. For seven years I scoured every cookbook I ran across, spent hours typing search terms into google and quizzed every German I knew on their baked-cereal knowledge. I baked batch after batch of granola and tried every combination of ingredients and techniques imaginable, but none yielded exactly what I was looking for. There were plenty of good ones, of course, full of oaty wholesomeness and warm spice, but they were all lacking something, some elusive combination of flavor and texture I couldn’t quite put my finger on. I started to question whether my perfect granola even existed. What if my memory had been playing tricks on me? What if Lip Lady’s granola wasn’t actually as good as I remembered it? What if I had romanticized it to the point where every granola I ate for the rest of my life would disappoint me? But of course I wouldn’t be telling you this story if it didn’t have a happy ending. As it happened, one night a couple of weeks ago, on the fifth straight batch to come out of my oven in as many days, I finally cracked the code. It was a remarkably small thing that did it, actually—just a change in the type of oats I use—but it was enough; before it had even finished cooling I knew this was the one. I delivered a handful to Manuel to get a second opinion and was met with astonishment. “This is the best granola you’ve ever made,” he exclaimed, and quickly inhaled half the batch. It certainly was, possessing every quality I have been trying to recreate for seven years: large, irregular clusters that retain their crunch to the bottom of the bowl; a light, crisp texture; a heady blend of vanilla and spice that conjures up oatmeal cookies and fragrant spice cakes. I’ll be the first to admit it may not be an exact replica of the granola I tasted in Huanchaco—heck, even my tastebuds don’t have that kind of memory—but knowing that actually makes it taste even better. It’s my recipe, after all, not the Lip Lady’s. And of course it’s yours now too, because the last thing I would ever dream of doing is keep it to myself. Okay, so what exactly makes this granola different? I’m no kitchen scientist, but I can point out the things that seem to have the biggest impact. One thing is the addition of oat flour, which helps the grains and nuts stick together into those much-coveted clusters. Another is the use of sugar; as much I like liquid sweeteners like honey and maple syrup, they seem to produce a tougher, chewier granola. Finally, the right kind of oats are essential. For years I only baked with regular rolled (‘old fashioned’) oats because that’s what recipes called for, but as soon as I switched to the smaller, thinner ‘quick oats’, the changes were remarkable—clusters formed, everything baked faster, and the texture became exquisitely light and crunchy. If you can’t find quick oats where you live—and I have lived in a few places where oats come in one variety only—here’s what I would do: pulse rolled oats in a food processor a few times to break them down to about half their original size. It won’t be exactly the same but it will come close. Preheat the oven to 300F/150C. In a food processor, coffee grinder or blender, grind half the oats to a fine powder. In a large bowl, combine the whole oats, ground oats, nuts, seeds and spices. In a microwave-safe bowl (or in a saucepan over medium heat), combine the brown sugar, butter and water and heat just until the butter has melted and the mixture is bubbly. Stir the mixture together until smooth, then stir in the salt and vanilla. Pour this mixture over the oats and nuts, stirring well to coat (I usually do this with my hands). It should be uniformly moist – stir in another tablespoon or two of water if it isn’t. Let stand for about ten minutes. Spread the mixture out on a large baking sheet, separating it into irregular clumps with your fingers, and allowing space between the clumps for the hot air to circulate. Slide into the middle of the oven and bake for 25-30 minutes, or until the top is golden brown. Remove from the oven and stir, gently breaking up the mixture into small-to-medium sized clumps. Return to the oven and bake another 15 minutes or so before stirring again. Repeat the bake-and-stir until the mixture is a uniform golden brown and completely dry; this usually takes 1-1 1/2 hours. Cool completely, then stir in any dried fruit you want to use. Store in a covered container at room temperature. Serve with milk or plain yogurt and fresh fruit as desired. Thanks! I’ll have to try this… my weekday breakfasts for the past year have consisted of home-baked granola, and I’ve almost settled with a recipe of my own, but yours sounds interesting. what a lovely post and recipe! How interesting! I make granola once a week, because we have it for breakfast every morning. Your method is quite different from mine, Rolled oats, rolled rye flakes, chopped almonds, a mixture of cinnamon, vegetable oil, golden syrup (or honey) and water. Only 20 – 30 minutes in the oven. Then I add finely chopped dried apricots. The sweet taste of victory! You must be so pleased, to have found the secret after all this time. I don’t like granola at all, but you’ve got me tempted to try this one. If there was ever a granola to woo me back to the fold, sounds like this would be the one. Congratulations. Melissa,If I were to go through my recipe files, I have no doubts that I have more clipped recipes for granola than any other iterm combined. What is it about granola that obsesses us?But I see I shall be bookmarking another one to try!As always such a wonderful post and your description of The Lip Lady is just too funny. Great story! And the recipe sounds fabulous…I will most certainly try this. Your recipe looks so delish. Another must-try recipe! Thank you for sharing your secrets with us. What a beautiful picture and recipe! This sounds like a fabulous recipe. I’ve tried several disastrous recipes, but I’m hopeful about yours. Thanks you for sharing it! As a fellow granola-lover, I’m really excited about this recipe. But as a person allergic to tree nuts and most seeds, I’m kind of at a loss as to what I might be able to substitute. Are the chopped nuts essential to this recipe, and if not, what might I be able to substitute? Wow. I spent quite a lot of time in Peru, and particularly in Huanchaco, many years ago. That was where I learned to make the best ceviche of my life: in a seaside hut from a fisherman’s family who still fished the old way, on the caballitos de totora, the fishing canoes made of bundled reeds. When I was there, there were no pensiones run by Europeans — only barebones sorta places where you could stay for the equivalent of about 50 cents a night — but for another quarter, the señora of the house would cook you an egg in the morning to have with your fresh roll and cafe con leche. So I never ran into your cranky liplady, but I’m certainly thrilled to try your granola, which sounds absolutely delectable to me. Thanks for this recipe, Melissa. That photo is really lovely. I love the blues. Thank you! Thank you som much for this kind of granola recipe. I have been looking for months now for a crunchy,sticky granola like this. You are right about the old fashioned oats.I had the same experience. From the bottom of my heart, I thank you for both your willingness to put up with the Lip Lady and your kitchen-detective skills. This granola looks so marvelous that I’m half-tempted to walk out into the driving thunderstorm currently pounding my neighborhood just so I can get some oat flour. 🙂 Thank you, dear Melissa, thank you. Yahooooo! I did it! I did it! and it was just what I was looking for: Crisp, so fragrant and just perfect for breakfast with my bowl of milk. Thank you so much Melissa, you saved my breakfast. Have a great week. Melissa, I share your pain. I hate secret recipes. There are a couple I’ve wanted from local restaurants. A generous owner shared one with me a few months ago, but the other, I fear, is lost — the restaurant shut down a couple of months ago. Your perseverance is commendable, I would’ve given up a long time ago. Bravo to the Lip Lady!Melissa, this is a masterpiece of a recipe. My house smells of cinnamon, cardamom and mace…with an oaty goodness that must make the angels sing.I bought a bag of granola at the farmers market this weekend for an outragous price and realized that I could do much better. 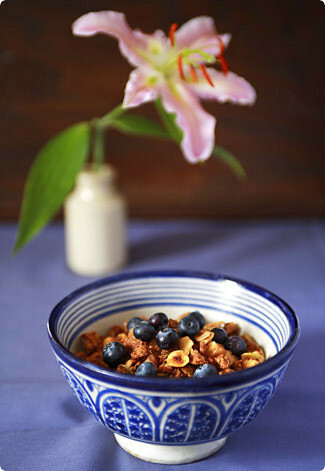 I made your granola…with golden flax seed instead of oat flour and was amazed and delighted. I added all sorts of lovely dried fruit…cherries, blueberries, raisins, dates…and have been over the moon since and looking forward to breakfast which is quite unusual.This morning I mourned the last bit of granola…as I gave some away and I live with my brother and he has been endulging as much as I. I came home this evening and he was vigourously making a double batch. No flax seed but glorious none the less. Now we are contemplating making homemade yogurt, to go with the granola. I need to ask…does the obsession ever end?The farmers market granola is sitting on my shelf in shame.Thank you for sharing. hi Melissa!I just made a batch and am eating it with yoghurt as I am typing this!! It tastes so much like a dessert and a treat!! !thanks for sharing!!! I tried this granola this weekend and it was wonderful! I couldn’t stop nibbling on it. The only thing I would add is some kind of taste contrast. Like dried sour cherries to counteract the fairly uniform nuttiness. I will be blogging about it shortly. I also made the butter. My mom loved it! This granola is sooo good. I made some on the weekend and have been eating it with yoghurt and stewed rhubarb, now I think I will have to make a second batch. Very nice indeed- thank you. I’ve been making my own granola for a while now (always with a mix of quick oats and a rolled oats, bran, flax seed mix I found) and my wife and I were doing a "cleanse" of sorts after a hedonistic cruise where… well, we ate… it was a cruise. Anywho, I couldn’t use sugar. I like Maple syrup and honey, but wanted something different. It took some experimenting, but I found adding apple juice worked wonders. It made the pre-baked mixture more moist than I wanted and I had to experiment. the first batch was CHEEEEEEWY. But after some more trials I managed to get it and it’s ridiculously tasty, has a hint of apple, it’s sweet and it has no sugar. I’m going to try your recipe because it sounds absolutely fantastic! Cin, loyces, kitarra and emily – I am so happy to hear you liked it! Let me know if you make any changes that you think are worth repeating. Dried fruits are of course a great idea – I’m personally a fresh-fruit gal but the thought of sour cherries and plump dates has me salivating. Hi Melissa,The granola looks absolutely tempting and I would love to make it were it not for the dearth of ingredients where I live. Just a couple of questions though:When you say quick oats, can Quaker’s Oats be considered quick oats?And what exactly is ground mace?Thanks in advance and I am glad you pursued perfecting your granola recipe because I am confident it is absolutely gorgeous! Hi Chris – Quaker Oats actually come in different varieties, though if you only have access to one kind it is probably the regular rolled kind. Quick oats are characterized by being very light and thin, and like the name says, they cook much more quickly than regular oats.As for mace, it is the outer lacy covering of the nutmeg fruit. Here is some more info: http://www.mccormick.com/content.cfm?id=8220Good luck! I discover your blog, your pictures are amazing ! Just in case anyone was thinking of making substitutions… I made mine with coconut oil instead of butter and Rapadura instead of brown sugar, and only 1/3 and 2/3 cups of each (reduced since I used fewer nuts). It came out tasty, although not very sweet. But I didn’t get clumps, only individual flakes for the most part. That always happens to me when I make granola!! I just don’t have the clump thing figured out yet. Too much stirring perhaps? Totally yummy. I love the spice combination. I made this last weekend and it is the hit of the household. The grandkids beg it for snack. I threw in some dried wild blueberries, too. Thanks for all your effort. It was well worth it. For the three cups of nuts (yuk! ), I substituted:1/2 c dried blueberries1/2 c dried cranberries1 3/4 c dried mango (chopped/diced/minced)1/4 c flax seedsIt’s fab — thanks! God bless you and your seven year quest. I too had the most incredible granola in Oaxaca at a bed and breakfast run by a woman who also owned the best restaurant in town and had a cooking school. While she parted with several recipes, the granola recipe remained elusive. I made your recipe last week and, while it is not exactly what I had in Mexico, it has the same light, crispy texture I remember. I will continue to experiment with the nut/seed mixture I use, but I will be more than satisfied to make this again and again. Thanks! Melissa-I absolutely love your granola recipe and have turned many friends on to it. One question: it’s often hard to find oat flour and I’m wondering if you know how the recipe would be impacted if I used oat bran instead? Laurie – Oh, music to my ears! I’m so glad you like it. I actually just changed the recipe because a lot of people seemed to be confused by the oat flour. When I make this myself I just grind oats in a food processor, coffee grinder or blender. It’s really easy. If that’s not an option for you, though, some people have reported successfully substituting flax seed meal for the oat flour. You could even try white or whole wheat flour. The important thing is that the mixture ‘clump’ when wet, and for that reason I’m not sure if something coarse like oat bran would work, but really, I’m just speculating. MelissaThank you for the fantastic recipe. I made it this past weekend, and it was everything you said it would be: light, crisp, highly aromatic and delicious. I added toasted pine nuts, almonds and dried fruits to the mix. It’s a hit around the house and with all my friends – there’s only barely a handful left in the pantry! What a great recipe and there aren’t many breakfast recipes out there are there?This is simple enough to try and I’d like to see how close this comes to "Quaker’s Harvest Crunch". just made this and tried it. i had no idea granola could taste THIS good.i will never ever buy the packaged stuff again!! Fantastic granola! Using quick oats really does make a difference in the final texture, and it’s a little easier to chew, in my opinion. I also love the cardamom which is a spice I have regretfully never tried using in granola. I too replaced some of oat flour with ground flax seeds, and replaced the butter with a coconut/sunflower oil mix, it worked out beautifully. Thank you very, very much for sharing your wonderful recipe.P.S. I think liquid sweeteners would work well here if the amount of water is reduced (or eliminated depending on the sweetener). If using honey, I would use less than 1 cup because honey is sweeter than sugar. I don’t have a scale, and my quick oats come in a 2lb 10oz container. How many cups do you think your pound of oats comes to? 3? Lindsay – I looked it up on the GourmetSleuth ingredient database (a fantastic resource, btw) and they say it’s a little more than five and a half cups. I would go ahead and use six! This granola ROCKS! Thank you for sharing, Melissa!I made half the recipe last night and only added a handful of almonds I had lying around and no dried fruit. I didn’t have oat flour, so I just blitzed half of the quick oats in the food processor. Instead of vanilla extract, I used orange blossom water. Wow! That worked really well with the cardamom and nutmeg (no mace). If you’re omitting the nuts (and dried fruit), you’ll need to increase your sugar (I used 110g for half the recipe).I loved this granola so much that I made another batch this morning!One quick question: I would love to add some coconut – I have some finely grated unsweetened coconut (the type you use to make macaroons) – but I’m worried it’s too fine and might burn in the oven. What kind of coconut would you recommend? Hi Natalie, so glad you like it! Re: the coconut, I don’t think you need to worry about it burning in the oven. I’ve put things like sliced almonds and sunflower seeds in the granola, both of which burn very easily on their own, and they’ve come out fine after an hour and a half in the oven. Just make sure everything is well mixed before baking. Well, I finally got around to making this granola after reading this post ages ago! I usually make a "Christmas granola" around this time of year with dried cranberries, cashews and whatever seeds I have on hand. I package it in cellophane bags and tie a pretty red bow. Voila! the perfect present for the person who has everything. I was intrigued by the story of the lip lady enough to break away from my usual recipe (which features old-fashioned oats, generous amounts of oil and honey) and try this one instead. Unfortunately the results were not the ones I’d hoped for. What I made resembled Grape Nuts cereal. Dry little unattractive pebbles. (And yes, I did follow the recipe faithfully, even down to the oven temp. Also I have freestanding oven thermometer and also used a reliable electronic scale). So, I’m going back to my old recipe having learned my lessons: 1.) Never break away from something that already works well. 2.) Stay away from instant oats. I’m about to make my 2nd batch, I LOVED the first and gave some as Christmas gifts in wonderful old fashioned canning jars. Today I’m trying a fat free version, I’ll substitute apple sauce for the butter and apple cider for the liquid. For those allergic to tree nuts you can use pumpkin seeds and sunflower seeds. I’m making a double batch so I’m going to mix it up in a small trash bag, then there’s no bowl or stock pot to wash! I couldn’t tell from your post when to add the spices. Should they just be mixed in with the oats? I just made a batch (forgetting the spices) and it was incredible, I can’t wait to try it the correct way! Hi, I noticed the post from "CLF" and thought I’d pick up on it in case anyone else is having similar problems; I think the fault lies in the use of "instant oats" instead of "quick oats". They are not usually suitable for substitution for quick oats, as they have been precooked (and sometimes have other additives), whereas the quick oats are simply normal oats rolled extra thin. Using instant oats in recipes calling for quick oats tends to result in them being severely overcooked & turning to mush!Hope that helps!I have yet to try making this granola, but I will do very soon… it sounds yummy. I’m a foodie and I love to try new recipes. I don’t repeat very often, so those that I repeat are the best of the best, and even they don’t get made a lot. And I used to be very free about sharing recipes, until I noticed that many people I shared with labeled it “their” recipe. I’d hear friends of theirs clamor on for them to please make “Jenny’s Fabulous Blueberry Muffins” or “Tom’s Out-Of-This-World Seafood Stew.” This started to make me mad. Really it’s the same people who over and over again ask for recipes. And if they aren’t going to give me credit for finding them in the first place, then I could really care less about sharing recipes that are free to begin with. I’m not creating my own recipes, and they have access to all the same books I use. So there. I’ve become a stingy old hag who doesn’t share her recipes. But I just had to share my story because – not that I agree with this woman not sharing her granola – there is a flip side to someone who doesn’t share. Wow wow wow!! I just made my 1st batch and it is a flavor burst of goodness in my mouth!! I will definately make this again. I love the spices… Thanks for taking the time to figure out the lip lady’s recipe! Is it possible that the original recipe contained quinoa, a popular peruvian pseudo-cereal? Wow, awesome! I made this as I have been putting off cooking granola as I don't remember which recipe was my favorite and *now* I have this one to highlight in my fav list! I didn't play with spices or anything other than mixing hazelnuts, pecans, walnuts, and almonds for the nut portion… post thanksgiving loads of nut options! I didn't think it was "proper" of me to change the recipe on my first try since it took you 7 years to come to this creation!! I am looking forward to it cooling and me adding it to my homemade yogurt for breakfast. Thank you!!! Will definitely try this.Just a note: I was confused at first by your reference to "quick oats" and wondered if maybe I can't get them here – but I'm in Scotland, the Home of Oats, so that couldn't be. I studied the pictures on the Cook's Thesaurus link and concluded that the oats I have are in fact "quick oats" – but here they are sold as just "rolled oats", and the thick ones you call "rolled oats" are sold here as "jumbo oats".Hope this helps any other confused Scottish readers – and other UK readers, as I suspect this is the same UK-wide. I have to share my story. My son walked into my house and said, "Dad what smells so good." I said that I had just made some granola. He asked he could have some. He ate a few pieces. Then he got a bowl and some milk and ate some more. When he was done he said, "Dad, that was the best I've ever had. That's not the best granola I've ever had. That's the best cereal I've ever had! "I did change the recipe a little. I didn't put in any nuts. I was trying to keep the calories down a bit. I doubled all the spices. The first couple of times I made this I left out the cardamon because I didn't have it in the house. I finally found it for a reasonable price at a bulk food store. It certainly adds a nice flavor to the granola. If you've been leaving this out because you don't have the spice, please do yourself a favor a go get some. The spice is expensive in a regular store, but I found it it a Sunflower store very reasonable in the bulk food spice section.Thanks for all your efforts to perfect the recipe. I've made it several times.BTW, my son came over and learned how to make the granola so he could make it when he went away to college. It helps that it is so easy to make! Thank you!!! Got rave reviews with your granola recipe. Perfect crunch, perfect little nuggets, lovely flavor! I followed the recipe fairly closely, but replaced some of the oat flour with ground flax and wheat germ because I had them to use, and used regular oats because that's what I had. Used slivered almonds, chopped pecans, and coconut for my nut mixture.Excellent! So far it's good raw. Almost ready to pop in the oven. Ok outta the oven, cooled and I added craisins, apricots and pineapple. It is spot on yummy, my daughter is also in agreement. Another keeper. Looking forward to trying so of your other recipes. If this works, I'll be loving you forever. I'm also a liquid sugar girl, but will try this refined sugar you speak of…and shall grind my groats into flour for a little extra sticking power if necessary! Thank you!